As we always emphasize, “fitting” is the most important priority for wearing a suit. In general, there are three kinds of suit fit: classic fit which is loose and comfortable, contemporary fit which is also comfortable but yet not loose, and slim fit which is tight and fit wearer close to their body. Along with the development of suits model and baggy clothing trends was gone in early 2000s, many people tend to wear a slim fit suit to show image of neat and agile and modern style. Today, it’s our pleasure to tell you what parts of slim fit suit are meticulous designed to differ from other models. Shoulder: A narrower point-to-point shoulder measurement. Cut to follow the natural line of the body. Smaller and softer shoulder pads also characterize the slim-fit. Create a modern and sharp outline. Arm and Sleeve: Narrow width of the arm with a higher armhole. Slimmer silhouette fitted through the sleeve. The jackets are usually shorter in length than their regular fit counterparts. Express a slender aesthetic. Lapel: Slim fit jackets traditionally have a slightly higher and narrower lapel with an upper gorge. Waist: Sharply tapered waist. Slim fit suits allow for a slimmer waist in jackets. Create a streamlined effect. Length and buttons: Offering the shortest length to make a sleek silhouette. Most slim suits will have a single-breasted coat with two buttons rather than three with a higher button stance. Thigh: slim-fit suit pants will always have flat-front design. Cut close to the body to create a neat line. Calf: Sitting closely parallel to each lower leg, with a thorough slim cut. Cuff: Generally hugging the ankle, ending in a small leg opening. Build a neat finish. As you can see, there are so many details and designs in slim fit suits to create a modern and fresh look. 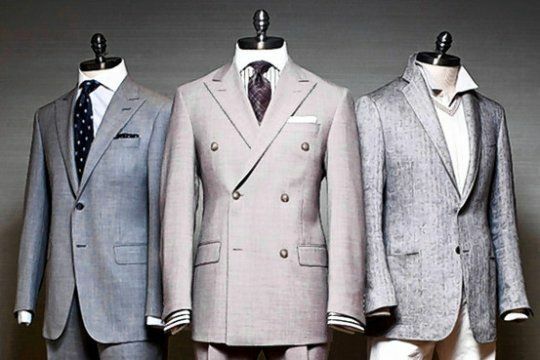 Looking into the future of slim fit suits you will start to notice the same silhouette, with slightly larger features. Wide lapel widths, wide slack cuffs, and wider ties. This is a more Neapolitan style which has really been in vogue recently. Slim is in, and we are happy to fit you up!